Click on item #23 in the shopping cart to buy this book. How the demise of Canada's national dream contributed to one of the greatest triumphs in American history. 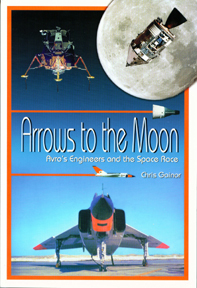 Tells for the first time the story of the Canadian and British engineers from Avro Canada who played key roles in putting Americans on the Moon and in building today's U.S. space program, including the space shuttle and the International Space Station. Other Canadian contributions to Apollo and a chapter on the Canadian space program are also included.